Beatriz (Salma Hayek) is a Mexican immigrant working as a healer in Los Angeles, whose car breaks down at the home of her wealthy client Cathy (Connie Britton). Cathy’s husband (David Warshofsky) is having business associates over for dinner, and she invites Beatriz to stay for the evening. 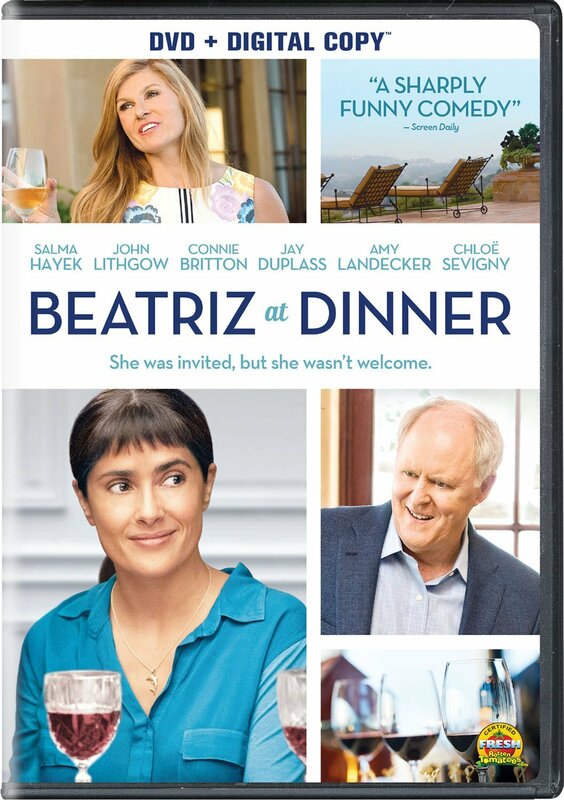 Beatriz is immediately out of place with the rich, elitist guests, who at first mistake her for the help, and she comes to clash with Doug Strutt (John Lithgow), an unscrupulous billionaire real estate developer whose business dealings are in direct contrast to her moral code. As the night goes on, Beatriz starts to confront Doug in ways that threaten to have serious repercussions. Directed by Miguel Arteta, from a screenplay by Mike White, Beatriz at Dinner is a dark comedy built around the inherent humour that can be found in watching people engage in uncomfortable interactions. The film could be summed up with the question, what would you do if you ended up at dinner with someone like Donald Trump? Would you tell them off and confront them, or sit silently? Beatriz decides to do the former, and the results are both entertaining and engaging to watch, while raising some interesting moral questions about how far you should go when given the opportunity to potentially stop a bad person. The film keeps slowly but surely upping the ante as we watch Beatriz and Doug start to test each other’s boundaries, before verbally sparring with one another, and then more physically getting at each other’s throats. Doug is the antithesis of Beatriz in every way. Beatriz comes from a poor background, where as Doug is rich. She is humble, and he is arrogant. She is an animal lover and a vegetarian, and he brags about going sport hunting in Africa. Salma Hayek and John Lithgow are both excellent, bringing shades and nuance to their respective characters, and playing off each other brilliantly. Backed up by a sharp script that manages to keep things interesting, their performances are the reason why Beatriz at Dinner is worth seeing. The DVD includes no bonus features. Beatriz at Dinner is an Elevation Pictures release. It’s 83 minutes and rated 14A.